In case you thought LNG export was only for Texas, Louisiana, Florida, Massachusetts, British Columbia, and Nova Scotia, the fossil fuel companies want to push fracked methane out through Georgia, too. KinderMorgan’s Elba Island LNG export terminal, with its north-to-south Elba Island Express pipeline project, is already in the formal permitting process at FERC. And it could easily interconnect with Sabal Trail to get its fracked methane. Plans continue for $1.5 billion-worth of development at Elba Island to allow the liquefied natural gas import facility to reverse its processes and export the fuel. 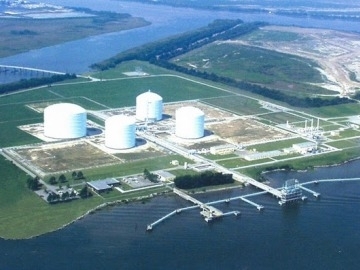 Southern LNG and Elba Liquefaction Co. filed a formal application for the project with federal regulators earlier this week.